Joining Ginny’s Yarn Along quite late again this week but here is my short update: This week I started a new book, Salman Rushdie’s “Des Mauren letzter Seufzer” (The Moor’s Last Sigh) from which I have only read a few pages yet so I can’t say much about it and concentrated on two projects: The Phoebe’s Sweater for Clara and my socks. I finished sock one and am halfway through sock two. 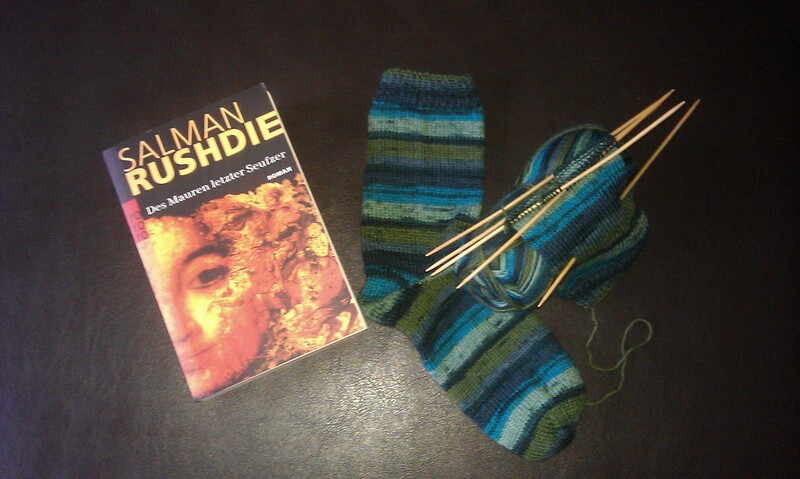 The picture is from yesterday morning but by now I already nearly turned the second heel. That was quite quick. 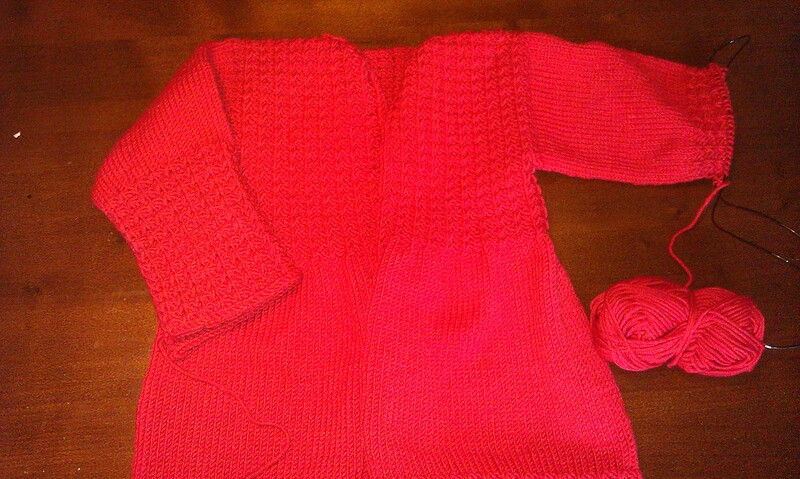 The cardigan is developing quite well too. I’m half way through the second sleeve and this means I should finish it on the weekend which is according to my plan to finish it in October. Then I can spend the rest of October that I’m still home on finishing the second sleeve of my brother’s Christmas sweater and knitting a bit on Leo’s Cardigan. You are now wondering what does she mean by “that I’m still home”? Well, we finally booked our holiday! Next friday we’ll do what many Germans do and go to Turkey to soak up a little bit of late summer sun on the Mediterranean Sea. Keep your fingers crossed for us that the weathers stays the way it still is, which is a perfect 27°C. And afterwards we will spend 5 days exploring Istanbul, something I wanted to do for quite some time. This should be the perfect combination. This entry was posted in Knitting & Crocheting and tagged Cardigan, Knitting, Socks, Yarn Along by kathatravelling. Bookmark the permalink.